the bottom one applies to figs. 5-8. Figs. 1, 7. Rhizosphaera reticulata. BSS 28B(IX/1266 and 1260). Figs. 2, 3, 5, 6, 8. Rhizosphaera arcadophora. Fig. 3: medullary shell only; note the two concentric spheres, and cp. with fig. 4. figs. 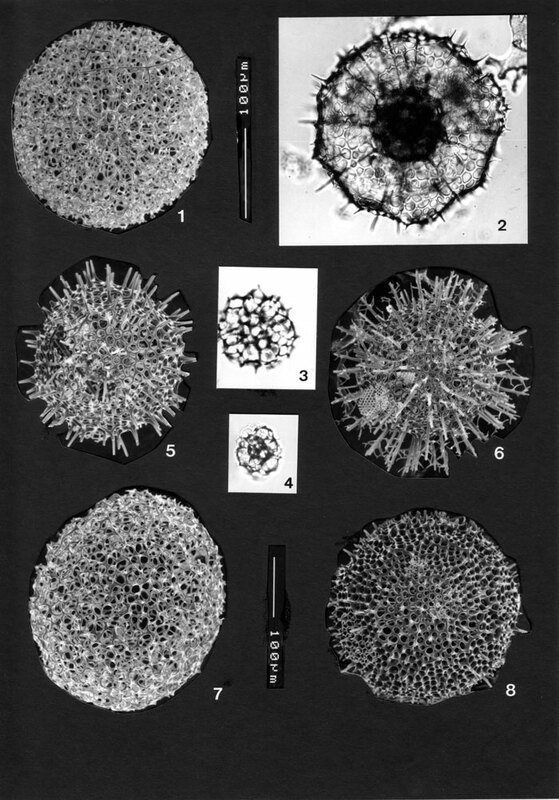 5-7: forms with numerous spines, some of which develop lateral transverses. Note thicker (cortical) shell and concomitantly smaller pores in fig. 7; compare also with pl. 29, figs. 1-4. BSS 13B(F2) EF Y43; BSS (no sample ID); BSS 28B(IX/1180, 1192 and 1199) and 28B(III/475). Fig. 4. Partially developed larcoid skeleton. BSS 21B(F) EF C27.